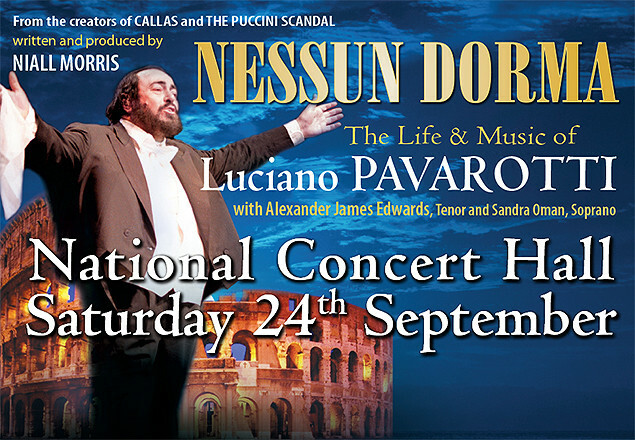 In conjunction with Pat Egan Ltd, Rewarding Times, in another exclusive brings you NESSUN DORMA - The Life & Music of Luciano Pavarotti - The Man Behind the Voice. Luciano Pavarotti extended his presence far beyond the opera house, rising to become an instantly recognisable icon of popular culture. With his enormously successful version of the aria "Nessun Dorma", used as the signature tune of the 1990 World Cup, he broke the boundaries between classical and pop music. He was seen by over a billion people world-wide in "The Three Tenors" where a new global audience warmed to his warm personality and golden voice. Internationally acclaimed tenor Alexander James Edwards has been thrilling Irish audiences over the last number of years. He played the tenor lead in "La Bohème" for a sold out run with Lyric Opera at the NCH. He starred as Aristotle Onassis along side Regina Nathan in the hit show "CALLAS" - the life and loves of Maria Callas - and recently debuted to great acclaim with the National Symphony Orchestra and soprano Celine Byrne to a sold out National Concert Hall. Of his performance in Niall Morris's "The Puccini Scandal" Gay Byrne (lyric fm) said: "Alexander James Edwards has a superb tenor voice which captivated the audience at the National Concert Hall." He recently performed "La Bohème" in New Zealand and had a huge success as Pinkerton in "Madama Butterfly" at the Royal Albert Hall. His Italianate tenor voice has often been compared to the young Luciano Pavarotti. Much loved Irish soprano Sandra Oman joins him in repertoire from "Tosca", "La Bohème", "Lucia di Lammermoor", "La Traviata", "Turandot" and more. Bright young soprano Donna Malone also features in a cameo role and there is further music by Mozart & Catalani and favourites such as "O Sole Mio","O Mio Bambino Caro" and of course the show-stopping aria "Nessun Dorma". Vouchers are valid for the show on Saturday 24th September.